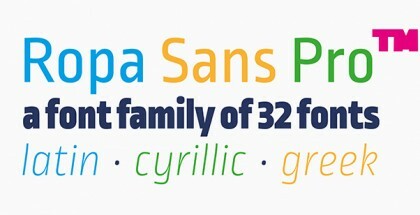 Riga font is a modern sans serif font with very interesting concept. It was created with the purpose to save space in different types of media or on the computer screen. Open letter forms, tall x-heights and economical proportions make the Riga font very practical and functional without impeding the look and readability of the text. This makes the typeface family very suitable for use in tight spaces like narrow columns and headlines, subtitles, subheadings etc. Riga can be successfully implied in a vast range of typography such as corporate design, logos, packaging, websites, newspapers, magazines and so on. 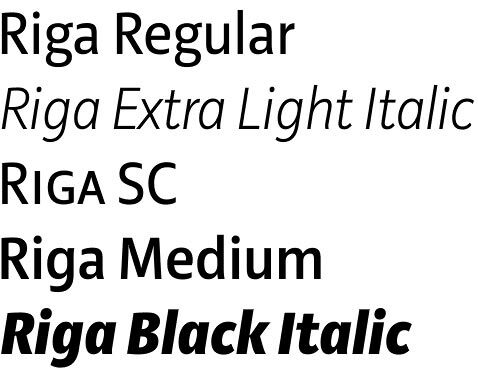 Riga font has 18 styles with large number of OpenType features. It also comes with 3 free fonts – Riga DEMO Regular, Riga DEMO Italic, Riga DEMO Bold for those who want to try the features of the typeface family. 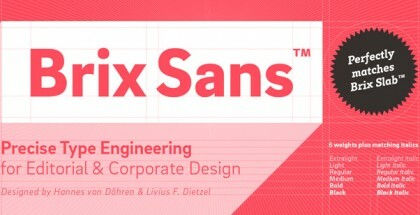 Riga font is a brainchild of the German freelance designer Ludwig Übele. He is the author of several very successful fonts, most notably Marat typeface family that was selected by the Type Directors Club of New York to receive the Certificate of Excellence in Type Design 2008. Get Riga font and enjoy the functional look of your text!